This is rather like being let loose in some over-stocked sweet shop – its bonbons are all top drawer and almost beyond reproach. The very full header above shows all that’s in store. It all amounts to a valuable souvenir of a very memorable evening. To the operetta. The fidelity and colour of the DVD recording, made obviously in 1990, is not of the highest HD standard that we have come to expect in recent years. The costumes and sets are pleasing if not especially opulent. Dame Joan Sutherland’s husband, Richard Bonynge provides bubbly music direction. Under his baton the Overture crackles with vivacity and playful mischief. Nancy Gustafson is a street-wise and impish Rosalinde determined to teach her erring husband a lesson. Her heart-felt and stirring rendering of the Act II ‘Csárdás’ impresses strongly and she is conspiratorially cheeky in those amusing Act I trios, first with her husband and then with her maid Adele. Sorrow at the prospect of his leaving is countered by the prospect of ‘while the mouse is away ...’ as Rosalinde’s faithless husband, Count von Eisenstein, Louis Oley is raffish but also buffoonish and sings colourfully. The celebrated German alto counter-tenor, Jochen Kowalski, is a rather too OTT Prince Orlofsky — who throws the party that is Act II — yet his drinking songs are full of hedonistic joie de vivre. However, it is Judith Howarth as Adele who really steals the show, a very cheeky maid. Her coquettish Act II aria, when she turns up at Prince Orlofsky’s ball in her mistress’s finery and haughtily disdains Eisenstein’s idea that she looks like his maid, draws very enthusiastic applause from the audience. The high point of Act II is when the three VIP guests come on stage (see header). Superlatives are just redundant. 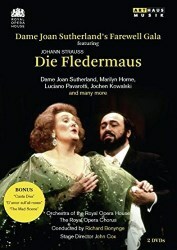 DVD 1, includes, in addition to Act I of Die Fledermaus, the three operatic excerpts, by Verdi, Donizetti and Bellini. They show Dame Joan Sutherland in three of her most legendary roles. These are rare recordings from the Australian Opera where she had started her career. A worthy souvenir of a very memorable evening. Dame Joan died in Switzerland in 2010, aged 83.